Heartbreaking Dawns on CNBC’s new Crowd Rules show – I Love It Spicy! 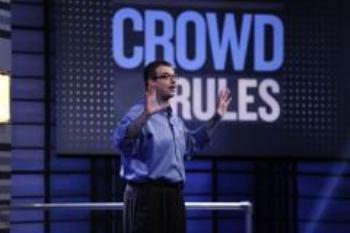 Heartbreaking Dawns will be competing on CNBC’s Premier Episode of Crowd Rules. It airs Tuesday, May 14th at 9PM EST. Tune in and see what happens. Below is a sneak peek on the first episode in which Johnny appears, plus video too. Each week, “Crowd Rules” features three small businesses that compete in front of an audience of 100 that votes to decide who wins a much-needed $50,000 prize. Entrepreneur and jewelry designer Kendra Scott, TV Newsman Pat Kiernan, along with a weekly guest industry expert, lead the examination of the small businesses in order to help a studio audience choose which company wins the $50,000. While the small business owners make their case to the panel of three, the real power lies in the hands of the audience – 97 strong – whose votes will ultimately decide which business is most deserving of the investment. Pickle Licious; Location: Teaneck, N.J.
Robyn Samra is “The Pickle Lady.” She has been in the pickle business for over twenty years. Her company, Pickle Licious, specializes in homemade pickles, pickled vegetables, and olive mixes as well as homemade relishes, olive tapenades & hummus. On some days you can find chocolate covered pickles and pickle-flavored gum in the NJ retail shop. You can also find Pickle Licious products online and in farmers markets in NY, NJ and PA.
Mr. Green Tea; Location: Keyport, N.J.
Mr. Green Tea Ice Cream Co. manufactures and distributes handcrafted exotically flavored desserts and ice creams. They have been creating their signature flavors, green tea, red bean & ginger ice cream for nearly 50 years. Mr. Green Tea recently launched pint size containers into the retail market and they are now available in over 300 supermarkets and grocery stores. Mr. Green Tea is a family run business owned by the Emanuele family. Heartbreaking Dawns; Location: Wyckoff, N.J.
Elizabeth Chambers is the founder and co-­‐owner of the wildly popular Bird Bakery in San Antonio, Texas. Elizabeth is currently the chief correspondent for the Human Rights Foundation and has served as a correspondent for the E! News Bureau and Access Hollywood, and worked as an anchor and correspondent for Current TV. Elizabeth has hosted a variety of shows on NBC, CBS, FOX, FOX Business Network and the Speed Channel. Best of luck to HBD – terrific sauces, and really cool folks. I hope they take the prize! Good luck you Johnny Mclaughlin take the prize!